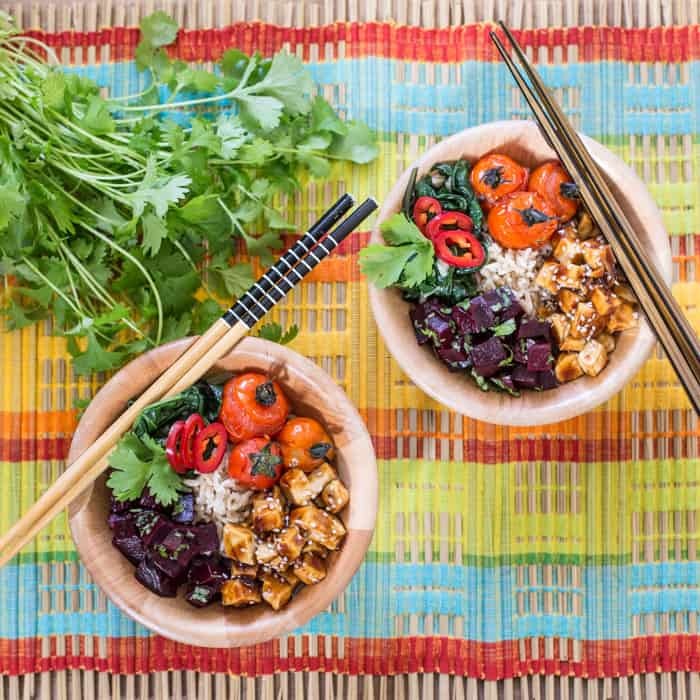 This Crispy Tofu Rice Bowl is nourishing, vibrant and will make you feel like a total goddess. Fact. 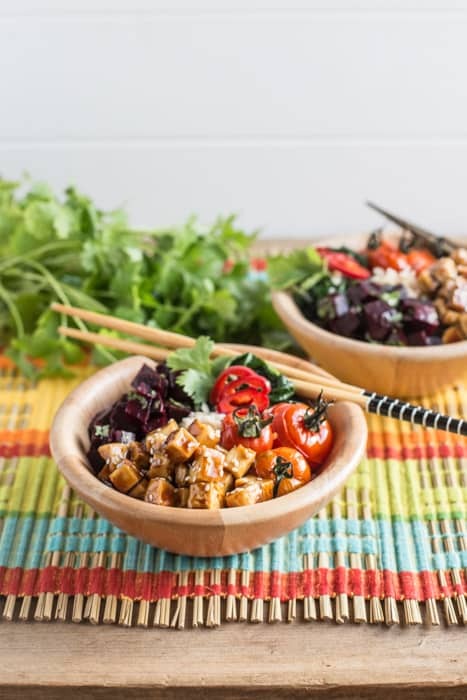 A Crispy Tofu Rice Bowl is not a recipe I ever would have thought would have graced the pages here at hedgecombers.com. But in support of #NationalRiceWeek I was asked to totally pull myself out of my foodie comfort zone and try something new. For a farm living, meat snaffling country lass like myself, tofu never usually makes it onto my shopping list let alone my dinner plate. So I figured that was a great place to start. Research shows that the average UK household rotates a grand total of NINE evening meals. OK, I guess our kitchen is a little weird as I cook so many different dishes for the blog but even so, just nine? That’s a horrible thought! This campaign is urging all of us to branch out and put something new on the table. Rice is a great case in point – if you always cook the same rice dish, mix it up by trying a creamy risotto. Or a stir fried rice. There’s also arancini, paella, kedgeree, sushi rice, wild rice, jasmine rice… so many amazing dishes to choose from! So first things first I had to work out what on earth to do with this little block of condensed soy milk. As with all foodie conundrums my first port of call was pinterest. I figured crispy-ing it up was going to give me a nice texture so I hunted down this, this and this article on said subject. Finally I stumbled across this very scientific tofu tome and broke out in a cold sweat. Steak is soooooo much easier to cook. But I persevered, and actually I’m pretty glad I did. This made a really yummy lunch, and whilst there was a fair bit of prep time, it was all pretty straightforward. And tasty. And moreish. In fact this recipe may be for two but Jonny didn’t get a look in :) One bowl for my lunch and one for my tea. Sorted. Want to give it a go yourself? Here’s the recipe. And if you do try a new ricey meal this week be sure share it on social using the #NationalRiceWeek hashtag. Do tag me in it too, I love to see what you all get up to in the kitchen. And if you need more ricey inspiration, check out Claire’s halloumi burrito. It looks so good! 1-2 cooked beetroot preferably not in vinegar unless that's your thing! Unpack the tofu and dice into regular 1/2 inch cubes. Lay the cubes out on a clean tea towel on a chopping board. Ensure the tofu is in one even layer before popping another chopping board on top. Lay a heavy pan or a few cookbooks on top to press the water out of the tofu. Leave for 20 to drain. Heat the oven up to 200/400/gas 6. Pop the cherry tomatoes onto a small baking tray and spray or drizzle with a little oil and put in the oven. 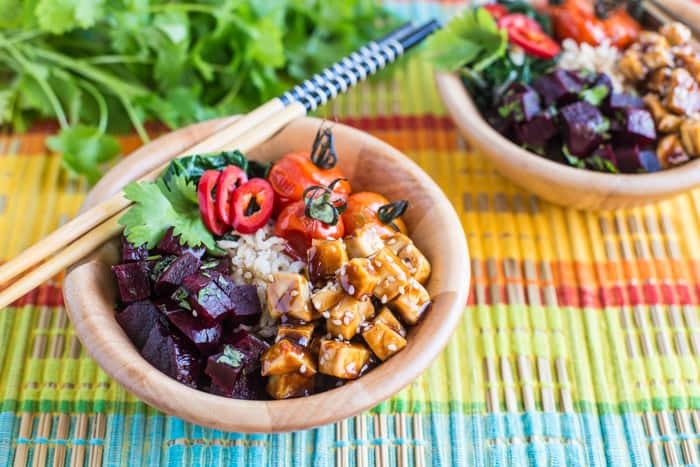 Blot the tofu cubes with kitchen paper and add them to a bowl along with a little oil and toss to coat each side in oil. Spread out on another baking sheet so they are not touching and bake for 30 - 40 minutes. Half way through the cooking time turn the cubes over. If the outer cubes are cooking quicker that the inner ones, like they did in my oven, switch them around too. Cook the packet of microwave rice and split between 2 bowls. Dice the beetroot and top each bowl with half. Wilt the spinach in a small saucepan over a high heat with a little dash of soy sauce and again divide between the 2 bowls. When the tofu is cooked pop in a dry bowl and stir through the hoi sin sauce. Top the rice with it and sprinkle with the sesame seeds. Finally load up the bowls with the roast tomatoes chilli and coriander and enjoy! If you fancy checking out some other recipes currently hitting the @NationalRiceWeek headlines, you can find Claire’s Mozzarella Stuffed Mushroom Arancini here. Just my kind of dish – I really fancy this for my lunch now! I love this tofu rice bowl! I don’t eat a ton of meat, so I love meal options like this! Looks yummy! Wow, these look lovely! I LOVE rice and I LOVE crispy tofu. My perfect meal right there.